Skiers ask me where is my home mountain? I ski around, it’s the nature of being a ski journalist. Just this season I skied 69 days at 24 different ski resorts, all unique and highly enjoyable. Not bragging, just offering perspective as I pondered where I feel most “at home” on my skis. In late April, I was reminded of where I most often find the best conditions and most perfect cord. Our first four consecutive runs were gorgeous untouched groomed corduroy, hardly another skier in sight at Sunday River. We skied from the Chondola to North Peak, Spruce and Barker to the steeps of White Heat all by 10:30. Our first turns on Tempest, the groomed granular was just starting to soften to spring corn as the sun peaked over the mountains. Wildfire and Right Stuff provided more sweet side to side skiing. After a Foggy Goggle lunch (one of my favorite places for après ski or a ski in ski out lunch with a view), we skied Jordan’s 1750′ vertical trails – Excalibur and Rogue. Most every trail had wall to wall white carpet, the entire mountain open, over 800 acres, and 50 miles of grooming – midweek in April!! Who does that? Sunday River does, and it feels like home… if I were to have one. Another favorite ski resort is Okemo Mountain in Vermont, where we typically start our ski season. No one blows early season snow like Okemo. We love the family atmosphere, the Vermont scenery, and the best on mountain cuisine in the East. Okemo means “come home” … and we always feel at home on these well blanketed ski slopes. If Okemo is our ski season starter home then Sugarloaf is the “King of Spring”! Killington is The Beast of the East, and Stowe is “Ski Capital of the East. We declare Sunday River is “Cord Capital of the East.” No one grooms like The River, miles of manicured seamless snow. Going off the groomers, Greg and I made a late season discovery – Super Nova glade at Aurora was loaded with natural snow – but I liked Blind Ambition better – more sun and better spaced trees. Another #bestskidayever, April midweek skiing on the entire mountain, a three foot snow base and the bonus of spring sun. Why store the skis away in May? I love Big Sky Montana, Vail and Beaver Creek, Snow at Aspen, Courchevel France, Kitzbuhel and St Anton in Austria! 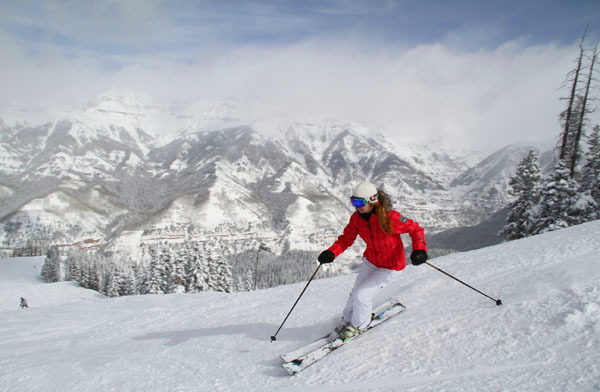 The ski mountains are my home…skiing my age in days is my annual ski goal… exponentially challenging! Who’s with me? How many days did you ski this season? Did you ski your age? Where’s your favorite ski mountain?